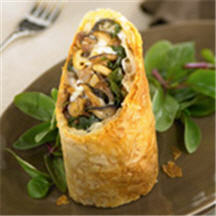 An elegant appetizer, crisp phyllo dough enrobes a delicious duck confit. Recipe by Chef Ulrich Koberstein. Melt 1/2 cup butter in large sauté pan. Add mushrooms, shallots, garlic, rosemary and thyme; cook 2 to 3 minutes or until mushrooms render their liquid; reserve. In another large sauté pan, sauté spinach until wilted. Combine spinach with mushrooms and duck. Season with salt and pepper. Cover phyllo dough with moist cloth to prevent drying. Remove one layer and place on work surface. Brush with clarified butter; sprinkle with about 1/2 cup Fontina Cheese. Repeat layers twice; end with layer of phyllo dough. Drain any liquid from mushroom and duck mixture; stir in 1 1/2 cups Fontina cheese. Place the filling along long edge of dough. Roll into uniform roll and fold ends under. Roll should resemble a large eggroll. Place on large baking sheet. Cool and slice into 4 sections. Serve with a simple green salad dressed and your favorite dressing. *Available in gourmet food stores.